Not many individuals understand the importance of maintaining a healthy mouth. Daily brushing and flossing, as well as heading to the dentist regularly are essential habits to adopt. Ignoring these practices can lead to various oral diseases, commonly known as periodontal disease. It is imperative that people implement positive habits to prevent these issues from happening. According to statistics, more than half of Texans aged 45 to 64 experienced tooth loss due to oral disease. It has also been proven that one out of every 7 adults in the U.S. aged 65 and older are missing all of their natural teeth. These issues highlight the importance of oral health, and individuals should commit to healthy oral habits to avoid tooth loss and other adverse effects. Dentists are always stressing to patients the importance of up keeping their oral health. Patients are often advised to brush their teeth every day and implement daily flossing. That is because the frequent consumption of food causes plaque to build up on teeth. Cleaning teeth thoroughly removes plaque, which left unchecked can produce acids that attack the teeth and gums. Neglecting dental cleaning can cause deterioration, the development of gingivitis, and eventually, gum disease if not treated appropriately. Ultimately, the gums begin to recede, giving bacteria access to tooth roots and the ability to destroy exposed bone structures. How Does Oral Disease Contribute to Tooth Loss? As mentioned, gums begin to pull away from teeth, creating pockets that food and plaque can easily be trapped in. These pockets with wedged pieces of food can lead to infection. As the disease progresses, the bacteria eat away at the bone, causing a weak structure that results in the loss of teeth. 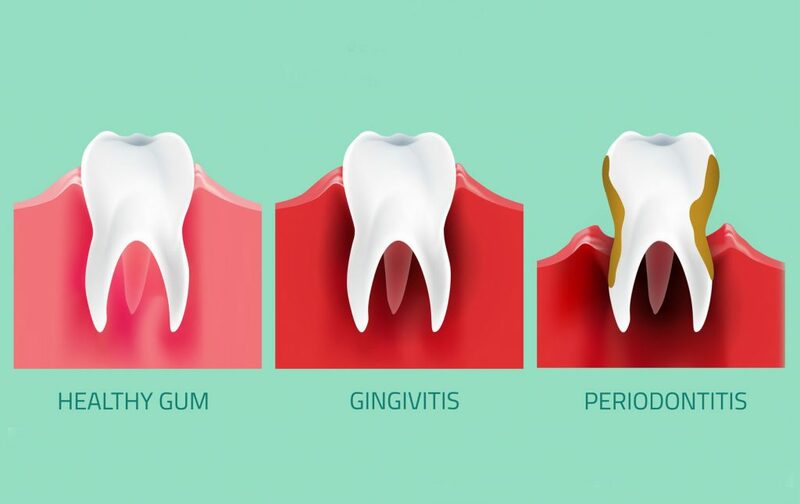 In addition to gingivitis, gum disease, and oral infections, other dental diseases can surface. These include cavities and oral cancer. Cavities generally occur when sugar and bacteria in the mouth create an acid that eats away at tooth enamel. In adults, cavities occur due to bacteria getting caught around the perimeter of a filling. Root cavities also happen due to gum recession and the exposure of roots, which are susceptible to cavities and damage. Oral cancer is also a common issue among adults. Heavy tobacco and alcohol use are some of the leading causes of this detrimental disease. Signs of oral cancer include difficulty swallowing, a white or red patch in the mouth, pain when moving the tongue or jaw, and more. At GPS Dental, we encourage patients to adopt healthy oral habits. Our job as professionals is to guide the oral health of our patients. Therefore, professional checkups and cleanings, in addition to everyday habits, are essential to avoid oral diseases. Should you be looking for a team of dental professionals that are dedicated to your oral health, contact our office in San Antonio to book an appointment.